Connectivity is integral to how smart lights work. 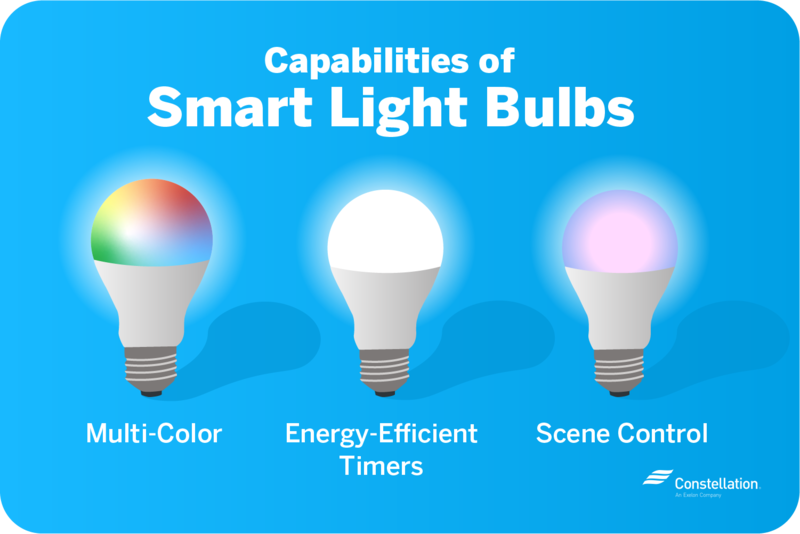 Smart lighting connects easily to other IoT devices—including home security systems like Constellation Connect — helping property owners create welcoming and energy-efficient smart-home or business environments. Smart light bulbs are long-lasting LED light bulbs that can be controlled and customized remotely through voice-controlled or smart technology. Smart lighting is often connected to Alexa, Google Assistant or another smart-home assistant, and it can even be controlled using smart-home routines. 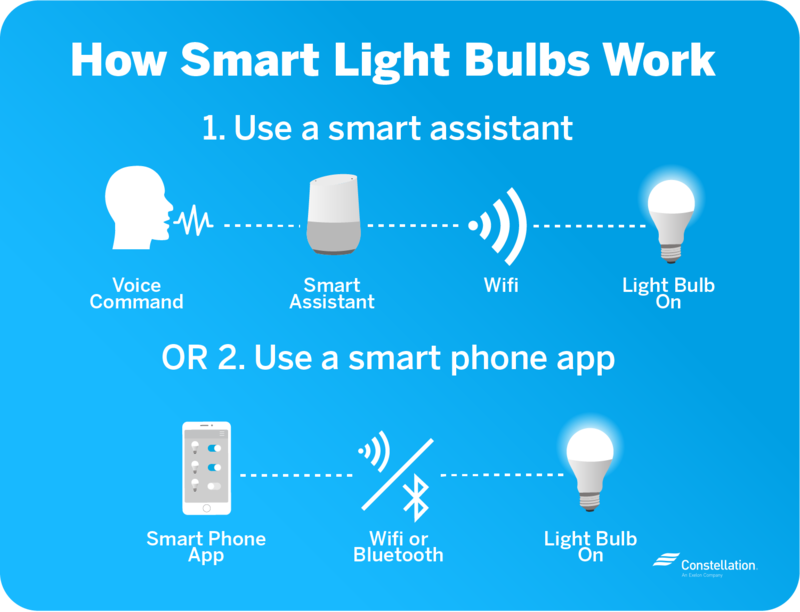 Through smart assistants, smart light bulbs can communicate with other smart devices in your network, such as appliances or entertainment systems. Networking with another Bluetooth-enabled device. The bulbs’ connectivity allows users to turn lights on and off using voice control or smart-home routines, or remotely through smartphone apps. No need to get up to use a light switch any more: a simple command can turn on every light in the building. What are smart light bulbs compatible with? Most smart light bulbs work with Wi-Fi or Bluetooth. If you don’t have a smart-home hub, you can control the bulb through a smartphone app. 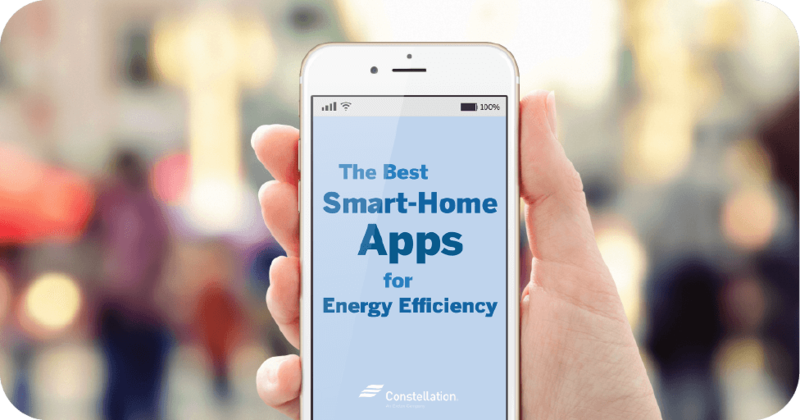 Connecting smart bulbs to home hubs like Constellation Connect can offer more reliable performance and allows the bulb to work in tandem with other smart devices in your home or business. Initially, smart light bulbs may cost more than regular compact fluorescent or LED bulbs, but smart light bulbs offer many benefits that can offset the initial costs over the long run. The best smart lighting options conserve energy, last much longer than traditional light bulbs and offer customization options that are both fun and practical. Lower energy use. Smart lights use CFL or LED bulbs instead of incandescent bulbs, and can reduce the amount of electricity needed to light a room. An ENERGY STAR®️–certified smart bulb uses 70 to 90 percent less energy than a traditional bulb. Longer life span. The average incandescent bulb has a lifespan of 750 to 2,000 hours. In contrast, the LED smart lights can work continuously for 35,000 to 50,000 hours, causing your lights to last longer. Increased security. Many of the best smart-lighting options include motion-detection features, so bulbs turn on or off depending on whether someone is in the room. This feature can be programmed to send alerts to mobile devices when unexpected motion is detected, both inside or outdoors. Easy-to-use light customization. Whether your property is a business or a private residence, you probably use certain lights at set times. Smart bulbs can be preset to turn on when you come home from work, dim toward the end of the night or turn off at specified times. Fun settings and uses! Smart lights are as fun as they are functional. Many can be set to change color or alter a room’s mood with settings ranging from bright and efficient to relaxing and romantic. Smart lighting includes both Bluetooth- and Wi Fi-enabled bulbs, smart switches and smart bulb sockets. Which type of smart light works best for you depends on your needs, your smart-home hub and your willingness to make alterations to your existing electrical system. Comparing smart bulbs: Wi-Fi or Bluetooth? Bluetooth-enabled smart light bulbs work by connecting quickly to any smartphone through the bulb’s app. Since Bluetooth has a limited range, you may not be able to control your lighting remotely, but it should work fine as long as you’re on the premises. In contrast, smart light bulbs with Wi-Fi capability connect to smart-home hubs and other devices through a router. This allows the user to control lighting through mobile devices in any location with an internet connection. 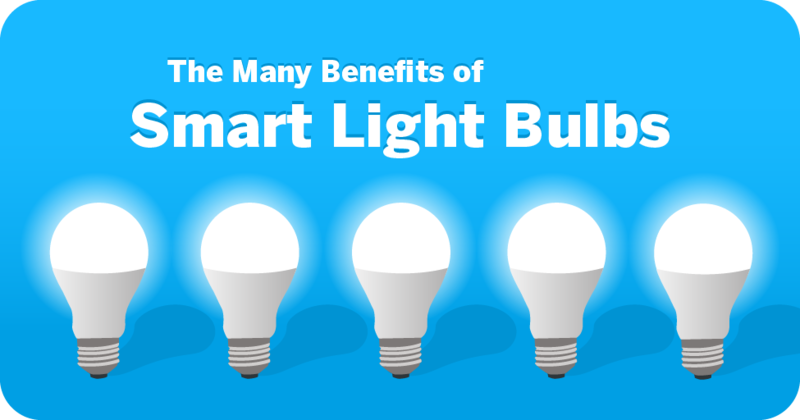 Smart bulbs are specialized bulbs that can be used with most light sockets. Smart switches, however, are installed in place of traditional light switches, and offer many of the features associated with smart bulbs and can work with any light bulbs. Even traditional incandescent bulbs can be used with smart switches (although given the energy-saving benefits of LEDs, using a smart switch to control incandescent lights is counterproductive). 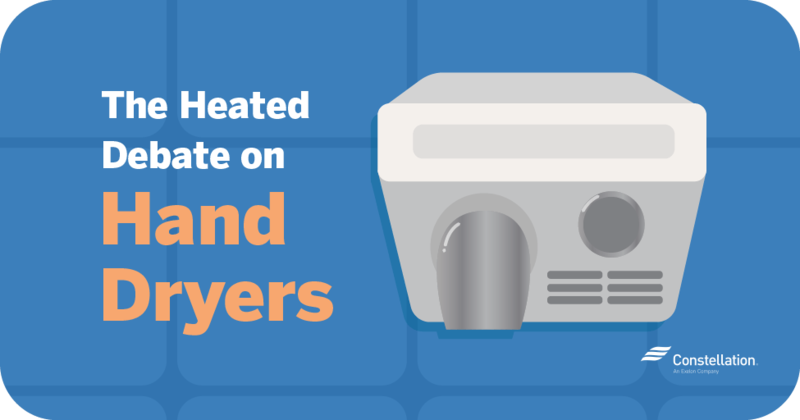 Smart light switches must be wired directly into your existing electrical system, and that means they have a higher initial cost than smart bulbs. What are smart bulb sockets? Smart light sockets are installed between normal light sockets and light bulbs and can be used to turn regular lights on and off. Each type of smart socket comes with its own features, with some allowing the user to dim lights or set schedules with smart-home hubs. Smart sockets add extra length between the light fixture and the light bulb, so in certain light fixtures, they may make bulbs extend too far out. Smart plugs can be used to control floor lamps, desk lamps and decorative lights, so they deserve a mention here. They can make any object a smart device by turning power on-and-off at the source, and can be controlled with voice assistants or apps. Smart plugs are especially effective when combined with energy-efficient string lights for indoor or outdoor use. What can you do with smart light bulbs? As the technology behind smart bulbs continuously improves, the best smart lighting boasts an ever-increasing range of options designed to increase both energy savings and customization. Here are a few of the best features available at present. Install smart bulbs to save energy. Since LED lights consume far less energy than incandescent bulbs, smart bulbs can save even more energy when they’re linked to motion sensors. Motion sensors will make lights automatically turn off when rooms are not in use. Control smart lighting anytime, anywhere. Everyone’s forgotten to turn off a light at some point. If you have smart lighting, you can turn of the lights even after you’ve left! Whenever you think you’ve left the lights on at home or at work, you can turn lights off remotely via your phone app so that they won’t burn energy when no one’s on the premises. Dim your smart lighting with preset settings and commands. Smart-assistant routines can be used to set lights to automatically dim under specific circumstances. In a restaurant, for instance, lights may dim to create a more romantic, intimate ambiance. 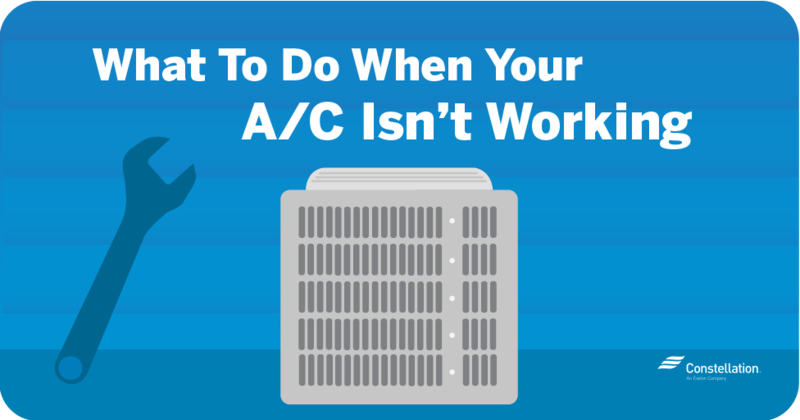 At home, you might create a routine where lights dim when you turn on the television, or even schedule softer lighting for when you usually eat dinner. Have fun with smart-color light bulbs. While incandescent lights can provide only a single color, certain LED lights can produce multiple colors. Smart-color light bulbs can be set to change color depending on your mood. For some ideas, green is great for relaxation, red has energizing properties, and blue works well to set a cool mood. Sync and play music with smart light bulb speakers. Smart light bulb speakers can be used to play music, news stories or podcasts in any room of your property by transmitting your voice commands to a smart-home hub. Some smart light bulb speakers can actually sync to music, flashing or dimming in time with the beat, to turn any room into a mini dance party. Improve your sleep quality with color temperatures. Depending on the type of bulb, light can appear warm or cool, and it can have an effect on your space. For instance, the effects of blue light on wakefulness are well documented. Blue light can disrupt the body’s circadian rhythm—the internal clock that regulates sleep. To improve sleep quality, try blocking blue wavelengths with smart-color light bulbs to reduce your exposure to blue light at night –– look to warm colors, like orange, instead. Smart light bulbs are increasingly common in homes and businesses and are valued for their energy conservation and versatility. When combined with smart assistants and home security systems like Constellation Connect, smart lights offer you the opportunity to tailor your lights to meet your personal needs. Where do I buy Smart Light items??? Hi Fred, you can find some smart light items on Constellation’s shop https://shopconstellation.energyearth.com/home/shop!